Wednesday we’re open until midnight. Open mic hosted by Gardner Berry starts at 7pm. Friday open noon to midnight. Jam session starts about 2pm. Andrew of the North and the Rescue Rangers go on about 8pm. Saturday open noon to midnight. 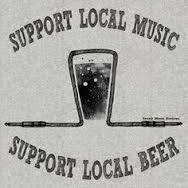 Jam starts at 2pm, Boneshakerz go on at 5pm, Lichen kicks off at 9pm. Sunday we’re open noon until 9pm.